Mounting evidence indicates that trade-offs between plant defense and reproduction arise not only from resource allocation but also from interactions among mutualists. Indirect costs of plant defense by ants, for example, can outweigh benefits if ants deter pollinators. Plants can dissuade ants from occupying flowers, but such arrangements may break down when novel ant partners infiltrate mutualisms. Here, we examine how floral visitation by ants affects pollination services when the invasive Argentine ant (Linepithema humile) replaces a native ant species in a food-for-protection mutualism with the coast barrel cactus (Ferocactus viridescens), which, like certain other barrel cacti, produces extrafloral nectar. We compared the effects of floral visitation by the Argentine ant with those of the most prevalent native ant species (Crematogaster californica). Compared to C. californica, the Argentine ant was present in higher numbers in flowers. Cactus bees (Diadasia spp. ), the key pollinators in this system, spent less time in flowers when cacti were occupied by the Argentine ant compared to when cacti were occupied by C. californica. Presumably as a consequence of decreased duration of floral visits by Diadasia, cacti occupied by L. humile set fewer seeds per fruit and produced fewer seeds overall compared to cacti occupied by C. californica. These data illustrate the importance of mutualist identity in cases where plants balance multiple mutualisms. 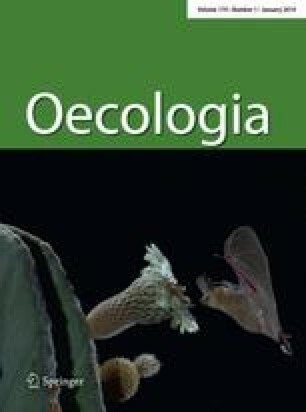 Moreover, as habitats become increasingly infiltrated by introduced species, the loss of native mutualists and their replacement by non-native species may alter the shape of trade-offs between plant defense and reproduction. The online version of this article (doi: 10.1007/s00442-013-2739-z) contains supplementary material, which is available to authorized users. Experiments conducted comply with the current US law and was performed in part at the University of California Natural Reserve System Scripps Coastal Reserve. For access to field sites, we thank D. Smith (Torrey Pines State Reserve) and I. Kay (University of California Natural Reserve System). We gratefully acknowledge field assistance by C. Johnson. Helpful comments on the manuscript were provided by A. Noto, E. Cleland, J. Nieh, J. Shurin and two anonymous reviewers. Financial support provided in part by an NSF graduate research fellowship (K.E.L. ), National Geographic Young Explorers grant (K.J.H. ), Sigma Xi Grant in Aid of Research (K.J.H. ), David Marc Belkin Memorial Research Scholarship (K.R.M. ), Cactus and Succulent Society of America Award (K.R.M. ), NSF DEB 07-16966 (D.A.H. ), and an Academic Senate Bridge Grant (D.A.H. ).